How important is a good business name? - Larsik Corp.
Finding it difficult to come up with a business name? Don't worry you are not alone. What is a good business name? It is the most important thing when you build and grow a business, right? Wrong, the name does not matter, what you do and how you do it is important. Of course, a good strong name does not hurt if you pitch your idea for Venture Capital or perhaps crowdfunding, but I have experienced during my career many cases a brainstorming session with clients starts with finding the right name. A?good catchable company name is very valuable, but many people start dreaming about their face on the cover of Fortune magazines instead of building the idea first. “Barking Dog”, “Mooing Cow” and the ever-popular “Hot Cola” are just a few of the code-names I have started or working on with friends and colleagues. None of these things launched with this name of course. Whether it was a name for a project for a customer or a personal project, the name itself came to during development as the project evolved. This also prevented “sticking” to the name and the original idea, it allowed for a transition It is natural to want to find the name first, and then go from there, but in reality, many ideas fizzle out for one reason or another. Perhaps?the idea?becomes too complicated to be viable for business, the idea already developed by someone else or the market is simply not big enough. Are you not happy now that you spent time finding the perfect name for a project that never went anywhere? At least you have the name, right? I come from a family where both my mom and my dad had or are running their companies. I guess being self-employed kind of runs in my blood. Although I have had a couple of jobs in the past, most of my professional career, I have been self-employed in Denmark, Spain and now in the USA. I thought my parents were boring in regards to picking a name for their businesses. I remember thinking my dad spent surprisingly little time and effort in naming his company. I ended up spending a lot of time, and I thought my ideas were good, and that it was important to have a good company name because that was important when you were a kid. I was wrong. I can see that now, my dad knew that the importance was in building the company and the name was less relevant. Perhaps he intended to change the name later on, maybe not. He never changed the name. In the end, his company name was “Firma Bent Koudal.” That's the Danish name, the best translation to English would be “Company of Bent Koudal.” My dad's full name is Bent Koudal so you can see why I thought that name was horribly uninspired. Not only was I wrong, but there was an additional benefit that I did not realize until years later. The branding value. My dad always produced quality work; it was important to him that everything that went out of his workshop was of high quality. That gave my father a good name and that allowed him to run his business for many years, all only with the help of his name. He built his brand around him, and his name and company became intertwined. He never once did any advertising all business came by word-of-mouth, and he ran his business successfully for decades. My mom was no better. When it was her turn to start up her own business, she went straight to “Firma Betty Koudal”. She uses a different name now, though, but her name is still in the company name. Maybe she remembers me giggling and decided to change the name. I was no better and kept my name in the company title as well for almost ten years. In that time, I got all my work through word of mouth referrals, and spend very little time doing any marketing. This is a short list of cool online name generators. Some of these checks if the company/product name you like has available domain names. Justin from Cool Name Ideas has a cool tool named Blog Name Generator. 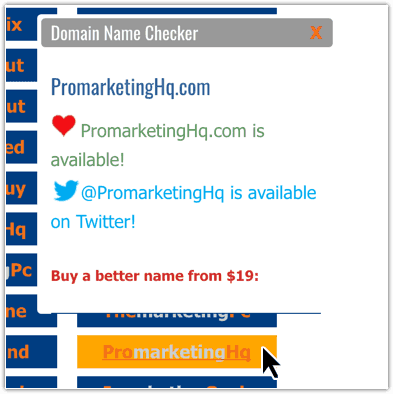 This is a very powerful tool for finding available domains with your chosen keywords. It is very easy to use and fast. You simply enter a couple of keywords, choose a niche, and off it goes. 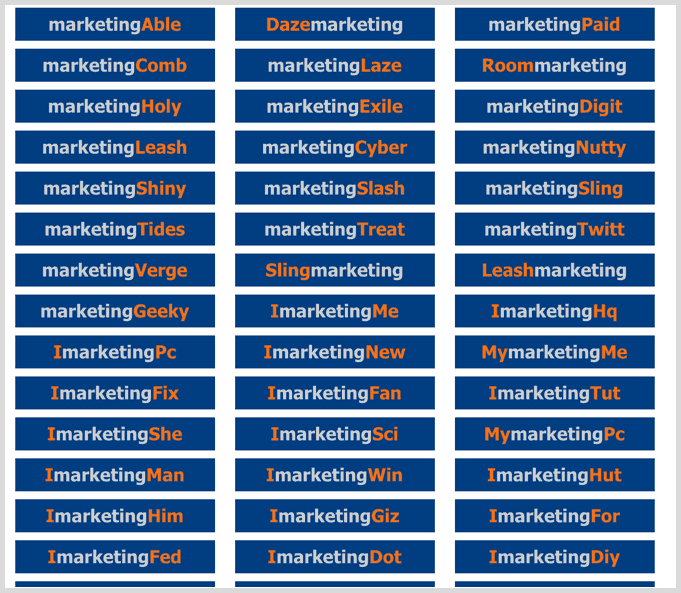 I made a quick test and simply searched for blog name ideas related to “marketing” and chose a topic for the related words. The first 700 results generated yielded a mixed result, but the list quickly sparks ideas and if you find a good name it is easy to check if it is available, simply click a result. A bonus is this tool also checks if the name is available on Twitter, so within a few minutes, I was able to find a plausible name. I think it would be possible to collect many plausible domain names in just half an hour. Naminum is a company, startup and website name generator designed to make your namestorming sessions smoother. Use the generator or start with a random list. I have used BustAName for a long time. It'?very easy to use. You can enter different names in groups, choose which TLD to look for, .com, .net. etc.. You can even get a list of synonyms to get even more results. The different combinations are tested, and the domain names you see are available to buy right now. Namemesh is a very cool domain name generator, and they also have a company name generator available here. 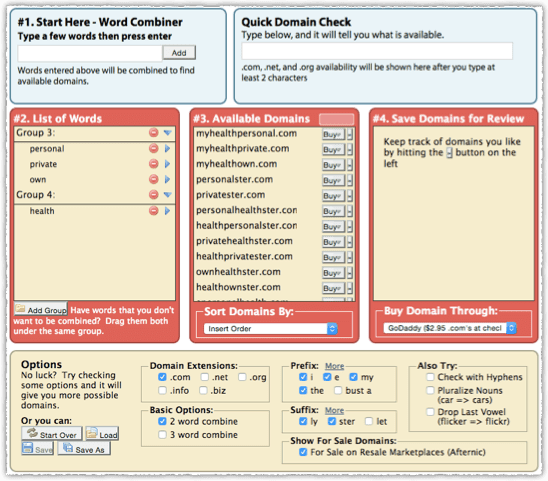 Great domain name generator Namemesh is very easy to get started with. These tools are a great help when you are looking for a new company or product name. These days things have changed, particularly if you work in the technology sector. You need a clever name, right? You do need a good name or catch-phrase to help to brand you or your company. If you have a good product, story or idea you can get exposure to thousands of people through Social Media such as Facebook, Twitter, Google+, Pinterest or whatever social media is relevant now when you read this. Continuously improving your business online and working with Search Engine Optimisation and social media can be complicated and time-consuming, but it is worth the effort for reaching your target audience. So, a good name does not hurt, but your mentality towards your business, your work, and your clients are what matters.